Fun is one of the most mysterious words in the English language. Catch it, contain it, bottle it and sell it if you can. Define it if you dare. Each person has a different idea of fun. Fun comes when you least expect it so be on the look out or you may miss it. Seldom have I found ‘fun’ when it was planned and most expected, and often I’ve found it when it was least expected. 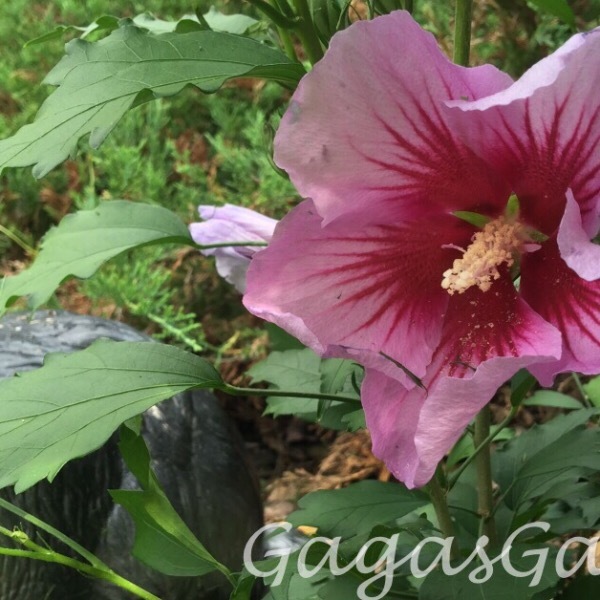 Such is the case when I discovered that a hibiscus is known by the name ‘rose mallow’. 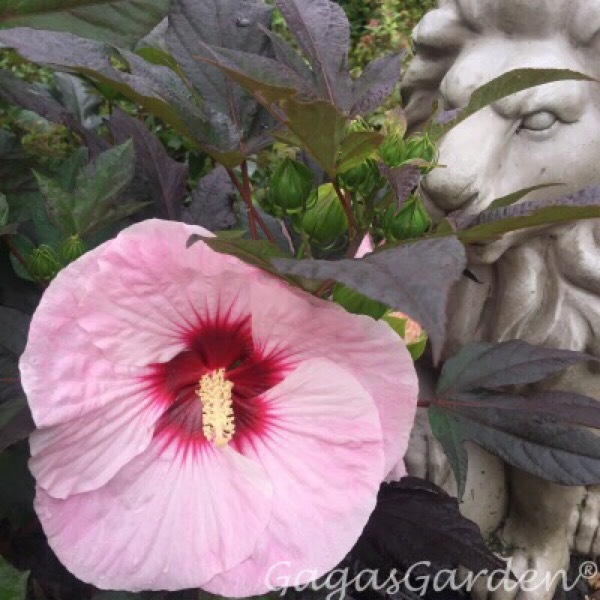 I planted this gentle tropical giant at the entry of the Rose Walk Way in the Rock Rose Garden. 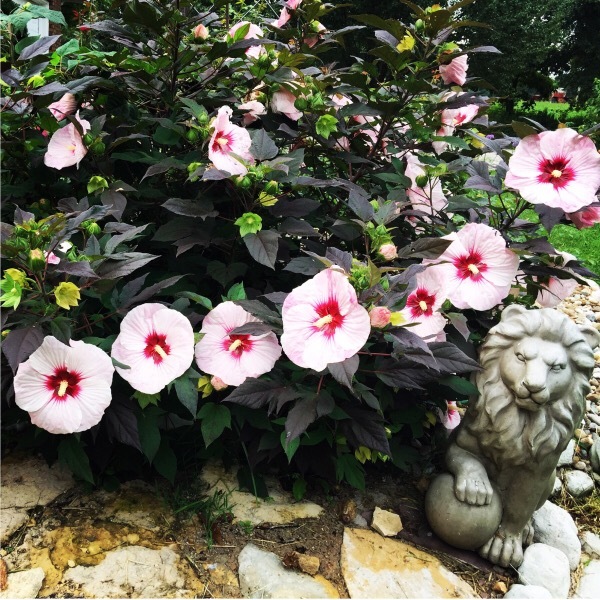 The shear audacity of a giant tropical ‘Rose Mallow’ planted in the middle of a country setting across from corn fields was fun and it tickles me pink. This is the essence of a juxtaposition. 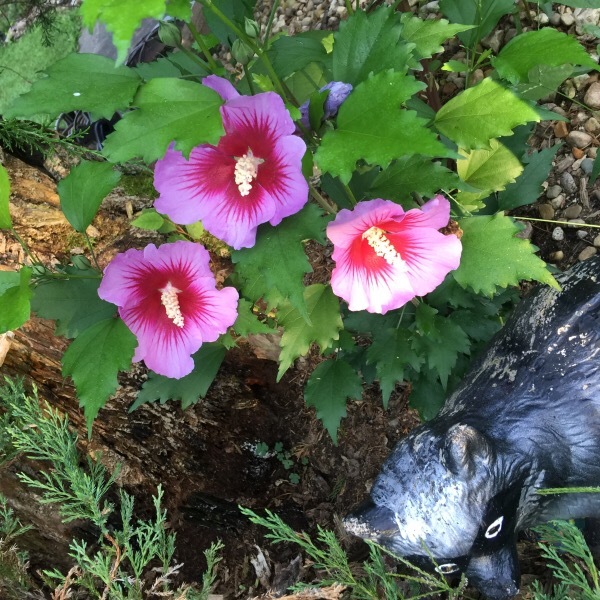 Native to China, the hibiscus is confused often times with many plants; from the ‘Rose of Sharon’ to Hollyhocks it has been cultivated in the United States and Japan for thousands of years. It’s the genus of over 200 plants! It comes in large rose, yellow, purple, pink and white flowers. 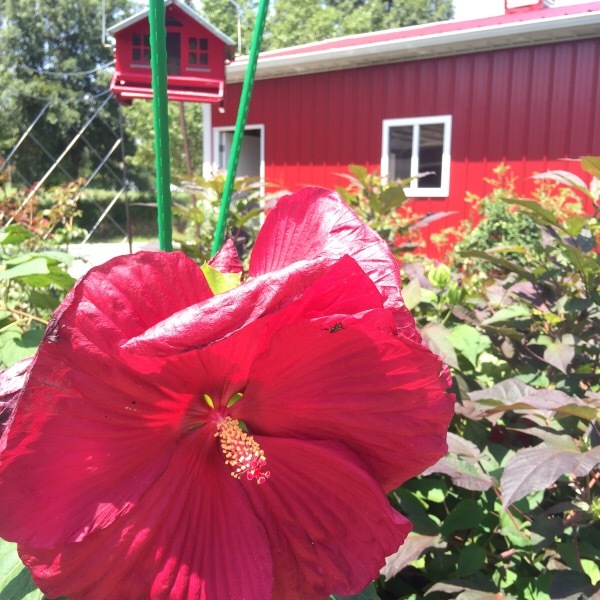 Most varieties have large flowers from 6-12 inches blooming in late summer. 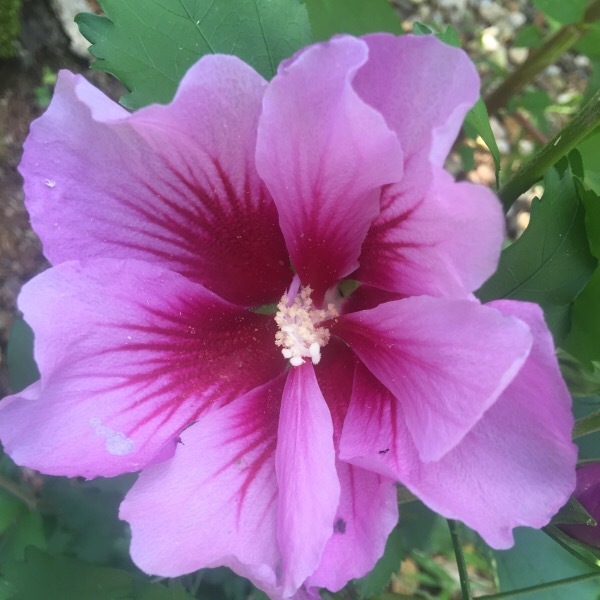 The phrase ‘Rose of Sharon’ that folks confuse the hibiscus rose mallow with appears in English in 1611 as “the flower of the field” in the King James Bible. The speaker (beloved) says, in the song of Solomon 2:1 “I am the rose of Sharon, the lily of the valley”. The previous translations had referred to it simply as ‘Flower of the Field”. Most interesting is a translation committee from ‘Song of Solomon’ 2:1 thinks “Rose of Sharon” is a mistranslation of Hebrew word for crocus. And etymologists’ tentatively have linked the word for beṣel, meaning bulb and understood as meaning either pungent or splendid. ‘Rose of Sharon’ is the National Flower of S. Korea. Its pronounced (moogooonwa). It was first used by the actual term mugunghwa and was first employed during the Goryeo Dynasty (918-1392). 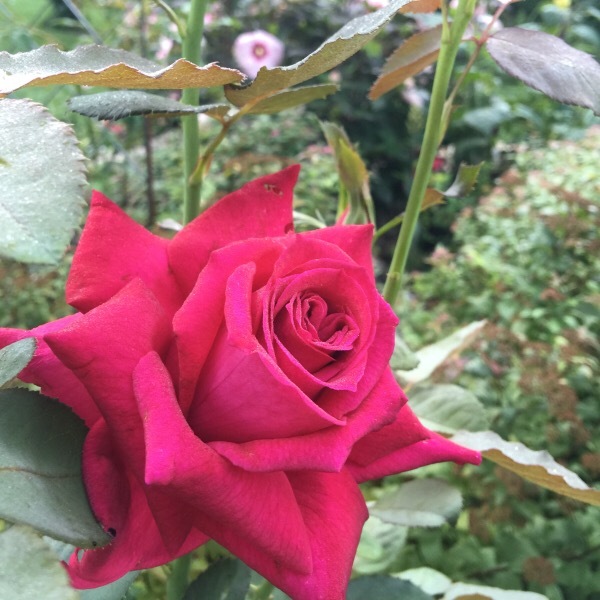 For more information about roses visit The American Rose Society Web site.